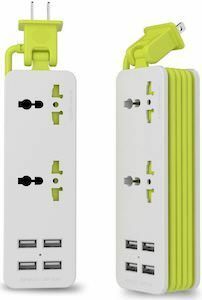 If you travel a lot then you know that there are never enough power sockets in your room and you need to take way to many wires and that is why you want this travel power bar with USB. The power bar has a build in surge protector and two power plugs with child safety and 4 USB ports of which two can give 2.1 amp and all can give 1 amp. And this power bar has a 5 feet cord that folds around it so that it is compact when traveling and gives you plenty of room to move around. And the power bar support 100 – 240 volt so you can take it on international travels too (make sure your devices also support 100 – 240 volt). 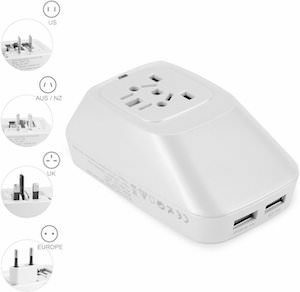 If you travel the world you know that power sockets are different in many countries and even the voltage differs and that is why you need this travel charger from Yubi. 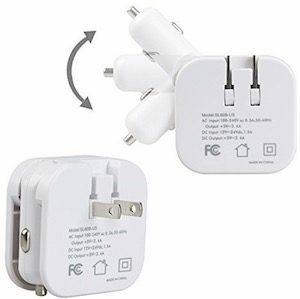 The travel charger offers a plug on one side while the back has 4 different plugs hidden inside ready to pop up when you need them. There are US/EU/UK/AU plugs and that will cover you for more than 150 countries. There are also 2 USB ports build in so that you can use that to charge your phone, tablet and more. And as a good travel charger, this one will cover voltage from 120 – 240 volt. We all know the problem you are on a trip and in your hotel room it’s hard enough to find one empty power socket but your need more. 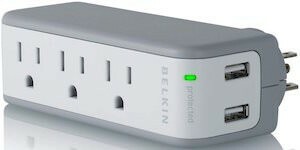 But now you can have the solution thanks to this Belkin power charger that offers 3 power ports and 2 USB ports by simply plugging it in. And the travel charger swivels so that you can easily adjust it to the situation. And because you can not always trust you power source they even build in a surge protector so that you are protected from spikes in power. 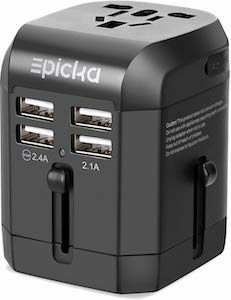 Any one traveling a lot with electronics just needs to have this charger in their bag as it will make life so much easier.